On a recent morning at Big Ray's, an outdoor clothing and gear outfitter in Anchorage, Erlene Iese packed a pair of Sorel boots and a flannel shirt into a box for shipping to a customer in Galena. But the roughly $300 order hadn't been paid for yet, and it might take weeks for the money to finally reach the store. Shipments like that one happen through a service called "collect on delivery" (sometimes called "cash on delivery"), or COD, which allows people to order items from stores but not pay for them until they receive the package. In rural Alaska, it's one way people make purchases from stores in Anchorage without having to venture to the city. "Many of the customers we talk to don't have debit cards. Some have credit cards," said Kate Mauldin, a trustee of 6th Avenue Outfitters in Anchorage, another shop that offers COD. "So this is their way of ordering." Each year, 6th Avenue Outfitters and Big Ray's send thousands of catalogs to households in rural Alaska. People typically place an order over the phone, wait for it to arrive, then send back a money order. Unsurprisingly, Permanent Fund dividend season and the holidays are among the busiest times of year. Big Ray's — a downtown store marked with a neon sign that reads "ARMY NAVY," from when it was called the Army Navy Store — is filled with racks of coats, winter skirts, rain jackets, coveralls and more. In a room on the lower level, Iese prepares boxes to ship from a warehouse a few doors down. "I love the idea of COD because you might not have the money, but by the time you get (the order), you have the money," she said. She's shipped out orders to "Bethel, Kotzebue, everywhere." 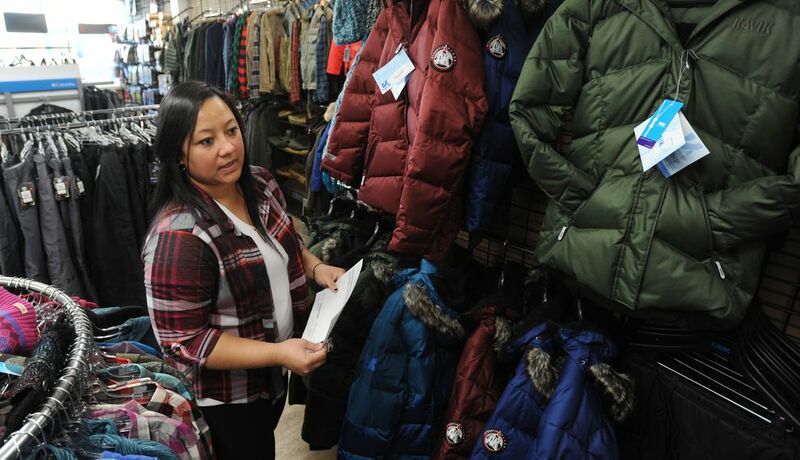 Winter parkas and children's snow gear are some of the biggest sellers through COD, said Samantha Roy, corporate sales manager for Big Ray's in Fairbanks. The company has five locations in Alaska and doesn't ship COD outside the state. "It's a way of life for people out in the village," Roy said. "There aren't banks in the village, but they have the post office, where they can make a money order." Mauldin said COD orders account for about 35 percent of 6th Avenue Outfitters' sales this year so far. (That's especially important as the store's business in the Anchorage market has declined because of competition from big-box stores, she added.) The store's winter 2017-18 catalog advertises parkas, hoodies, down pants, coveralls and XtraTufs on pages that say "CODs Welcome" along the bottom. "It's a lifeline for us, and hopefully it's a lifeline for rural Alaska," she said. "I don't think we'd be in business without COD." Dawn Peppinger, a spokeswoman for the U.S. Postal Service in Alaska, said the agency probably gets a "couple thousand" such orders that ship from Anchorage to rural Alaska every week. "When you're a postmaster out in these remote areas, you know what a COD is, and it's not uncommon to see them coming through," she said. Peppinger said that the service isn't as common as it was a few decades ago. "City stations used to get a lot more than what we get now. Ones that are more rural– they are the ones that get the majority of them now." In the Lower 48, Peppinger said, some companies do COD shipments, but "it's more concentrated in Alaska — to originate from Alaska and go to Alaska recipients." Walmarts in Fairbanks and on Old Seward Highway in Anchorage also use the service, spokeswoman Delia Garcia said. "I can't speak to all other Walmarts, but the unique characteristics of Alaska's geography make shipping, including COD and our new USPS priority shipping options, an important way we serve our rural Alaska customers and meet their needs," Garcia said. Sometimes there are limits on what a customer can order without paying. At 6th Avenue Outfitters, Mauldin said, they won't ship high-priced Canada Goose items via COD. At Big Ray's, there's typically a limit of $750. "I think you have to be a really trusting company, for one, to do CODs," Roy said. "You're allowing your merchandise to go out without any payment. … We've had cases where things go missing." She also said the service is a "dying thing," and that postal workers who work with the store don't usually like COD because of how messy it can be — there's a lot of extra work in tracking packages and making sure that merchandise gets returned if a customer doesn't pick it up or doesn't want it. Sometimes, Mauldin said, it can take months to get unwanted shipments back.